The Richardton food manufacturer is in what the food industry is called the "whole, clean" ingredient market. That market has been exploding in recent years due to perceived health benefits. The company produces organic and non-GMO flaxseed (brown and yellow), garbanzo beans (chickpeas), lentils, quinoa, chia and radish seed.The company in January started up a flax cleaning line in a multi-million flax and pulse crop processing plant expansion that will use less labor. The plant includes high-tech cleaning and pasteurization equipment. They expect to add a pulse line in 2019 and will have room for two more. A year ago, the company hired Jessica Schutt, a Dickinson, N.D., native, as director of food safety and quality. Schutt holds a doctorate in pharmacy from North Dakota State University. "Simplicity is king, and our ingredients are the most simple you can obtain — straight from the farmers' fields," Daneen says. "No additives. No preservatives, just clean, raw grains." Dressler describes Stone Mill as the "brand behind the brand," providing primarily flaxseed for organic and conventional markets. They sell whole ingredients and raw ingredients — packaging and storing them for food manufacturers. Stone Mill was started in 1979 as an ironworks manufacturer during an earlier oil boom. Daneen's parents — farmers and entrepreneurs Ambrose and Charlotte Hoff — still carry the titles of chief executive officer and chief financial officer, respectively. The Hoffs moved into grain processing in 1986. Ambrose and Charlotte gained a reputation for promoting and cleaning garbanzo beans, or chickpeas, which thrive in the drier western climate in that region. In 1993, they certified some lines as organic. Daneen came home to join the operation in 2002 after graduating in management information systems from NDSU. Ty grew up at Richardton on a family ranch about 20 miles to the north. He was trained in natural resources management and spent his early career in that but joined Stone Mill two years ago. During that time, they were gaining a reputation for cleaning "difficult products," including organic grains that carry higher levels of dockage. In 2008, they doubled their original facility — adding a new processing line, building and warehouse — to accommodate the expanding market. They quickly realized they needed to expand again. By 2017, the company split its food processing side, Stone Mill LLC, from its ag equipment company (Stone Ag, Inc.) which sells Westfield augers and other handling equipment. Daneen and Ty are in sales but since 2016 have increased cooperation with their largest customer, Terra Ingredients, a subsidiary of AgMotion Inc., both of Minneapolis. The 15,000 square-foot processing plant is flanked by a 40,000-square-foot warehouse. Behind and inside the buildings, there are dozens of bottom-loaded bins all made by Amber Waves Inc., at Richardton, which is a sister company headed by Daneen's brother, Jody, a mechanical engineer. "When the product comes into our storage bins outside of the plant, everything is computer-controlled from that moment," Ty says. Daneen's younger brother, Calvin Hoff, an electrical engineer, started Amber Waves Integration in Fargo and designed and installed Stone Mill's sensor system. The processing line separates by length and width, using sifters and destoning and aspiration systems. "It is still is somewhat of an art to get the grain as clean as we do and shoot for the purity levels that our customers demand," Ty says. Grain comes down a chute in single file and an electric eye uses a shot of air pressure to remove off-color seeds to go to other products, including feed for organic cows or chickens. The company is in the process of installing a pasteurization line. The pasteurization equipment looks like something out of the future, with unusual filtering equipment and electrical hookups. The pasteurizer has a quick-dry function that can sterilize without changing the color or flavor. It is also used with chia, a crop that is imported from Peru and other sources, and can be used for for herbs. The federal Food Safety and Modernization Act in the past several years has put new constraints on selling raw grains right out of the field. Some food companies are demanding the pasteurization process — a "kill step" — to ensure against pathogens, even if the risk is small. "While most raw grain has been not harmful, not historically been a problem, I think the U.S. is becoming a leader in food safety," Daneen says. Companies want to get "ahead of" potential recalls. The new pulse line will do garbanzo beans and lentils. It will include decortication, or skin removal, which is desired by some flour makers, particularly in the organic market, consolidating value-added steps. Stone Mill uses the warehouse to hold finished packaged ingredients as a service to its customers. Most are in 2,000 pound tote bags, but it also keeps some 50 pound bags for smaller mixes. Stone Mill contracts for its flaxseed and garbanzos. It sells seed and then contracts for grain from hundreds of farmers in a radius of 100 to 500 miles, depending on the year, between the U.S. and Canada. North Dakota is the No. 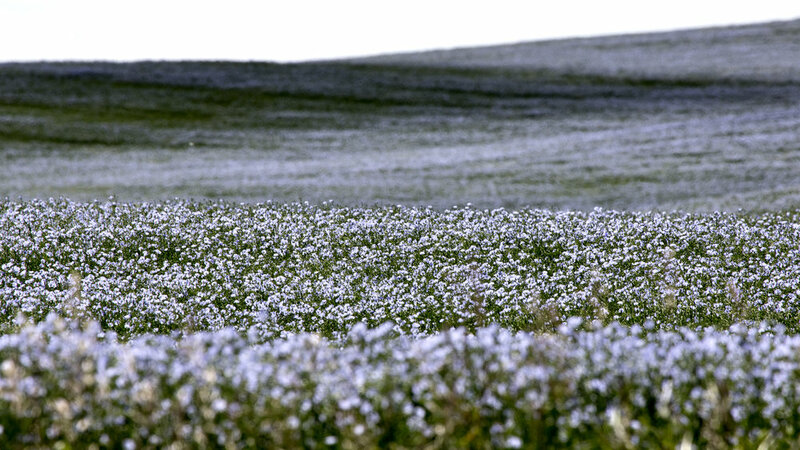 1 flax producing state, so the company is in the heart of that market. Conventional brown flax prices are relatively "boring and stable," usually in the range of $10 to $11 per bushel, Daneen says. Organic flax is about triple that price. Stone Mill supplies seed and contracts from growers from the middle of Montana to eastern North Dakota and into South Dakota. They go to several states and Canada for organic products. They typically have used 35 million to 40 million pounds of flaxseed. "We'll likely double that with the expansion," Daneen says. Flax doesn't contain gluten. They market as gluten-free because their new equipment has never handled wheat or other cereals that contain gluten. Their system protects from gluten to 10 parts per million, half of the industry standard amount to be considered gluten-free. The Hoffs initially exported many of their garbanzo beans to the Middle East, where they are a staple, but now feel more comfortable that they serve a large and growing domestic market which is largely unaffected by trade disruptions afflicting other commodities in recent months. Ambrose and Charlotte say they're happy to involve a family with so many diverse engineering and technical talents to grow their companies. "That's how companies grow, you don't just pass them on," Ambrose says. "You try to become state-of-the-art so the next generation has a good foothold in the market."